In this feature, Thomas Tuytens, MD and owner of Kentucky Horsewear, the technical horse boot brand talks about their unique over-reach boots and why when it comes to performance and protection, they are unbeatable…. The Kentucky Overreach Boots have a patented design, which also incorporates a new concept in over reach boots, seeing closer contact with the horse’s pastern. By fitting the boots, this way, people often think they are a little too small, but they are designed to be fitted in such a way that they have contact with the horses’ pastern. Their design protects the largest part of the hoof bulb and pastern and thanks to their anatomic design and the ‘no turn ball’ inside the overreach boots, they stay in place. The Kentucky Horsewear overreach boots are also extremely shock absorbing with the combination of D3O, EVA and neoprene offering 60% better shock absorbing, than the best overreach boots currently on the market! 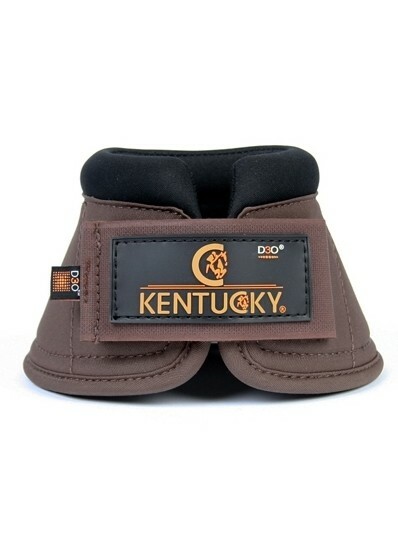 Kentucky offer two versions, one styled in the all-weather material Solimbra and also in PVC leather, which is slightly heavier and popular amongst dressage horses and driving horses. Over-reach injuries can see your competition horse out of work for several months and after one of her top horses was sidelined for 6 months with such an injury, international event rider Karin Donckers now never rides without her Kentucky Over-Reach Boots. Top show-jumper Lars Nieberg uses Kentucky over-reach boots, as does UK eventer Francis Whittington. Francis believes them to be an essential part of his training, schooling and competition wear due to their outstanding performance and quality. Another important factor to consider is that with horses with extremely sensitive skin at the pastern, you can still use our overreach boots with the additional protective layer of our Tendon Grip, which can be used as a second skin to protect the boots from rubbing. 1. Firstly you need to assess the level of lameness. 4. You need to also look at the whole leg with regard to injury, as there may be other damage to the leg not just at the site of the injury. You can use wound gel and dresses on the injury is it is minor, however if in doubt, always contact your vet. 5. Invest in some Kentucky Over Reach Boots –the best choice that you can make in protecting your horse’s heels!